We are going to Mount Rainier, Paradise, for a Night of Snow Camping! This is a cold night, so you really need to be prepared. Come to the meeting this Thursday to go through the equipment list. Warm sleeping bag and bivysack (or tarp) are important. We use snow shoes, and sleds and hike to our camping spot. 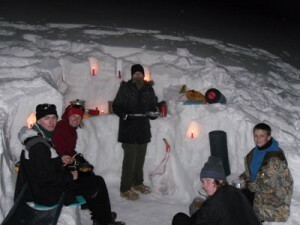 We then dig our snow caves and our kitchen and prepare for the evening. MEET: Saturday, February 18, 2012. Cars leave at 6:30 a.m.
GEAR: Dress For Warmth. The Troop has Snow Shoes.